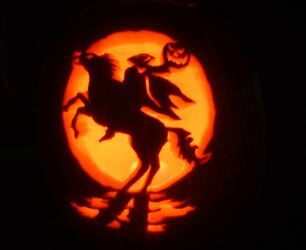 Well, hopefully this won't be the only pumpkin I carve this year. It came out cute though! It's Kon, stuck in his stuffed toy body from Bleach. 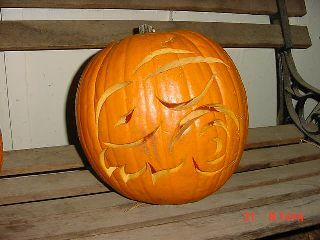 I actually carved this today (10/22/05) at Oni-Con, an anime convention in Houston. 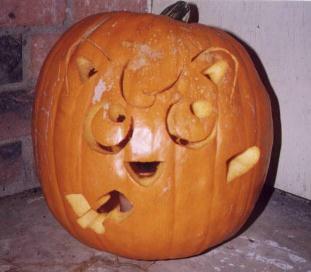 They had a pumpkin-carving contest, and there were three entries. I won second place, a Lupin III DVD! 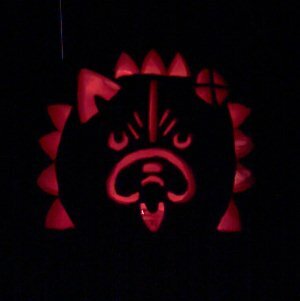 The first place winner was a pumpkin of Gaara from Naruto, which was really nice. The guy who made it used a regular picture and photoshopped it to come up with the design, where mine was hand-drawn, but that's okay. I'm really happy with it! 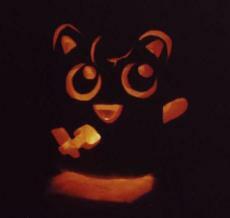 This year I also went to a Halloween party where we carved pumpkins. 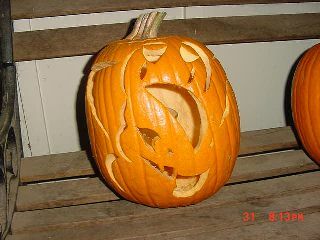 My creativity tapped out for the year, I decided to cut one of the patterns included with the carving tools. I thought this one looked cool, but I can't believe how long it took! I didn't even look at the skill level when I chose it - "challenging". But it came out pretty well. 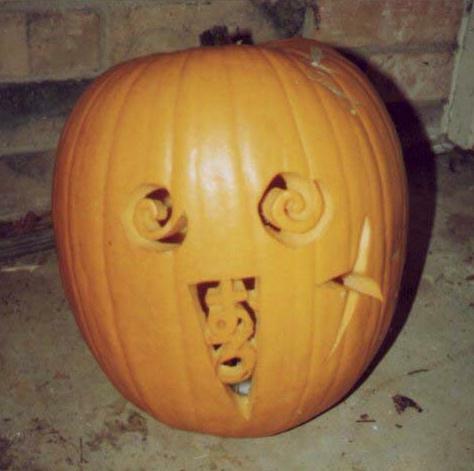 This is the first time I've ever tried to carve one of those things. Long time, no update! 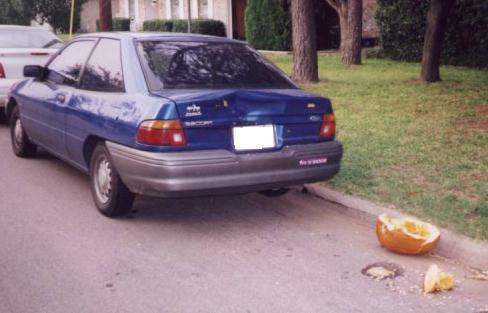 Sorry, I was in Japan for the last three years, and it's hard to get decent sized pumpkins for carving there. 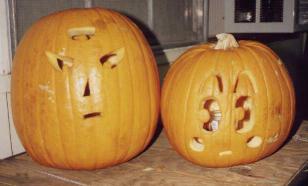 Anyway, here are some new pumpkins for 2003! 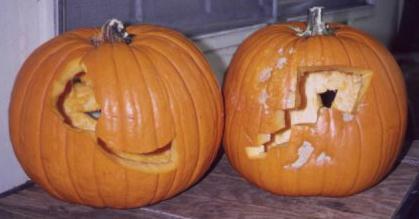 They're both Neopets pumpkins. Unfortunately, I wasn't selected for the art contest. Oh well. I'm really happy with how these came out this year, especially since it's been so long since I've actually cut a real pumpkin. This is Count Von Roo, a blumaroo vampire in Neopets. I based the design on one of the official pictures, but had to modify it a bit. The Shadow Usul has a really cool design. Usuls are sort of a cross between a rabbit and a squirrel. 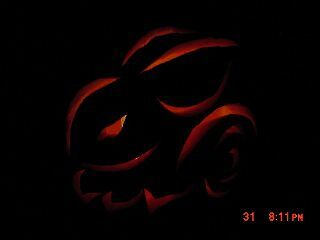 The Shadow Usul is really dark and mysterious, so I really wanted to try to carve it. I think it came out pretty good. The spiral part is supposed to represent the tail. 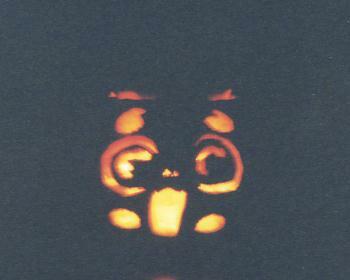 I actually did carve a couple of pumpkins while I was in Japan. One of these days I may try to scan some pictures of those. They're not nearly as nice as these, however. 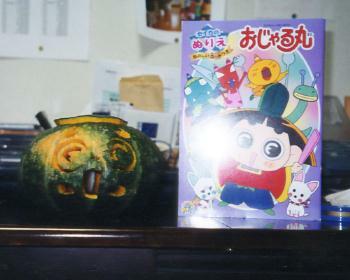 I finally have pictures of the two pumpkins I did my first year in Japan. 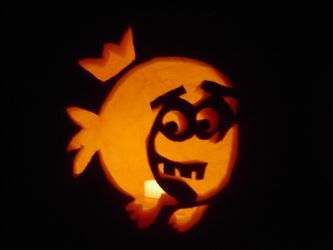 Because I couldn't get a regular carving pumpking, I used regular Japanese green pumpkins. These pumpkins are tiny, as you can tell from the picture. I only did this in 2001, figuring that it wasn't really worth the effort to repeat. Still, all things considered I guess they didn't come out too bad. I used them as a teaching aide for the schools, so I decided to carve popular children's characters that even the adult teachers would recognize. Ojarumaru is a popular character from an NHK cartoon that's on every weekday in Japan. I put a copy of a coloring book next to the pumpkin so that you can compare the face on the pumpkin to the face of the character. 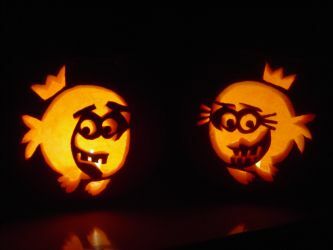 I tried to use characters who's faces were not only easy to carve, but who's head was just about the right shape for such a short wide pumpkin. Currypanman is a friend of Anpanman, a superhero who is always there to help feed the hungry and defend the world from the evil Baikinman. 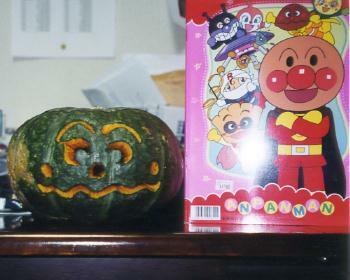 On the coloring book next to the pumpkin, Currypanman is the character dressed in yellow just above the head of the smiling main character. NEW PUMPKINS! 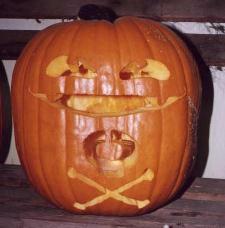 From Halloween 1999! 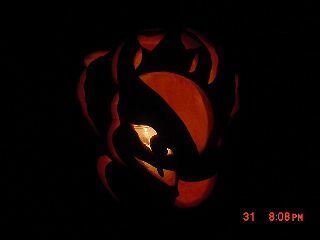 Once again this year I decided to go with Pokemon. 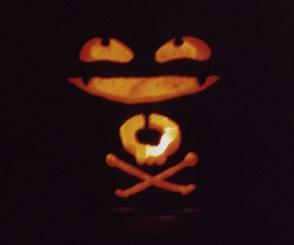 Last year I was a little ahead of the curve, but this year ALL the kids knew what my pumpkins were supposed to be! 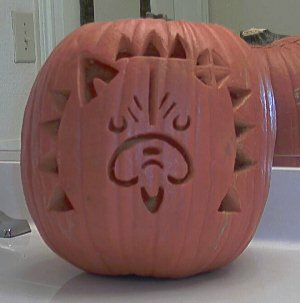 This is a Koffing (Dogasu) pumpkin. 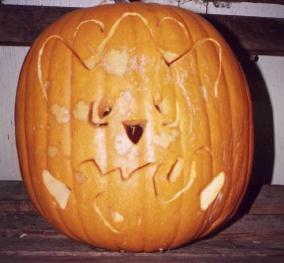 This is a pumpkin carved to look like Togepi. This one was the most difficult to carve because of all the fine linework. 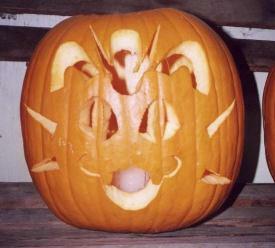 I also really had to think to figure out how to carve the designs in Togepi's shell without accidentally cutting them out completely. Some people don't like Togepi, but I think that little egg has a lot of potential. "Toge, toge, toge, toge. ..priiiii!" 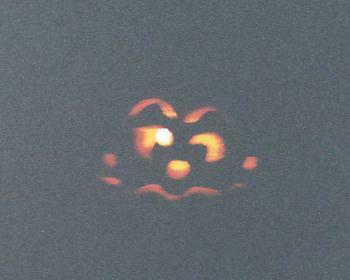 This is a Jigglypuff (Purin) pumpkin. Like Togepi, this one had a lot of fine linework. Just don't let it sing! Cats are supposed to be able to see well in the dark, right? 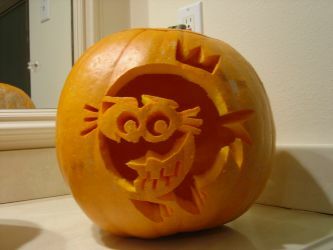 This Meowth pumpkin may have come out the best of all! I'm especially fond of cats (no kidding!) and so naturally Meowth is one of my favorite Pokemon. I think Team Rocket would approve. That's it for this year! Thanks for looking! 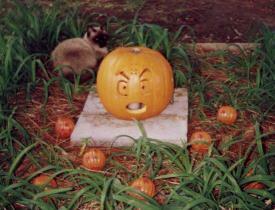 These are the pumpkins I carved for Halloween 1998. This year I had a Pokemon theme. 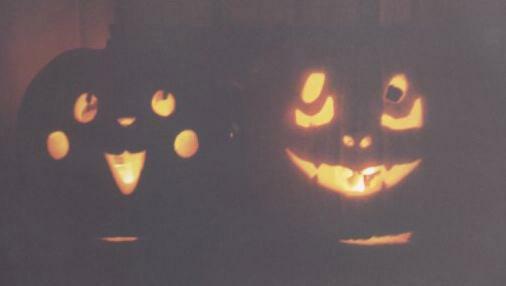 The pumpkin on the left is a Charmander (Hitokage), and the one on the right is a Pikachu. 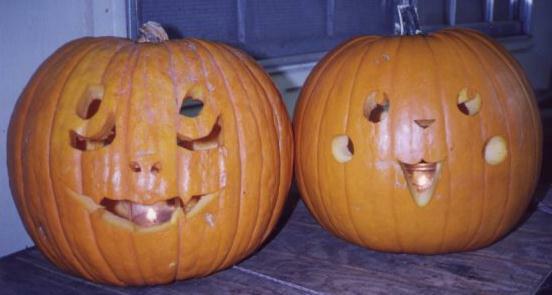 Even though I only carved two pumpkins this year, I spent a lot of time on them. 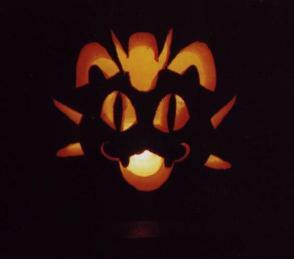 In addition to faces, I also carved tails. 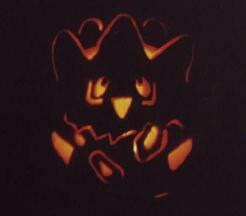 On the reverse of the pumpkins shown above, the one on the left is a Charmander's tail, and the one on the right is a Pikachu's tail. I attempted to take a picture after the sun had gone down on Halloween night. It's a little fuzzy, but I think it's cute! 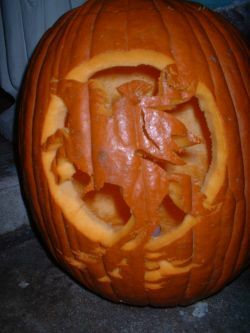 Notice that the pumpkins switched sides. The Pikachu is now on the left, and the Charmander (Hitokage) is on the right. 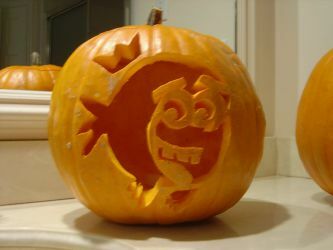 My sister (The Great Immortal) carved this pumpkin. Although it got a little moldy before this picture was taken, I still think it's impressive. It's the NERV logo from Evangelion. This is my cat, Samantha. 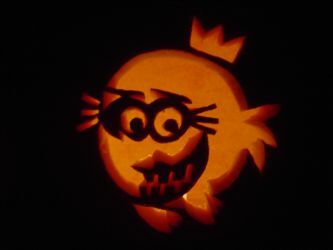 She's not a pumpkin. 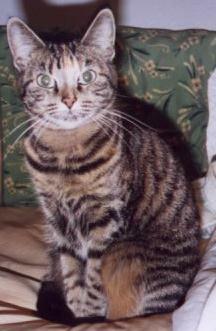 She was a little upset that Jasmine (who died in November, 1998 ;_;) had her picture on my webpage and that she didn't, so I decided to add her as my official mascot. The following are pictures of pumpkins that I carved myself for Halloween 1997. Enjoy! 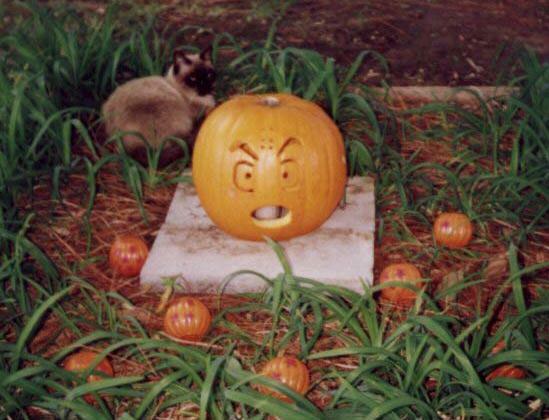 Kuririn the pumpkin-head surrounded by plastic "Dragon Ball" pumpkins. The cat in the back is Jasmine. 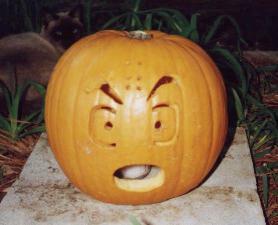 A closeup of the Kuririn pumpkin. Tenshinhan (Tien) and Chaozu pumpkins, based on the Dragon Ball characters. It took a while to figure out how to do Chaozu's eyes, but I think the effort was worth it. This pumpkin is based on the Rurouni Kenshin manga. It's Kenshin's face after getting knocked silly, with the word "Oro" written in his mouth. 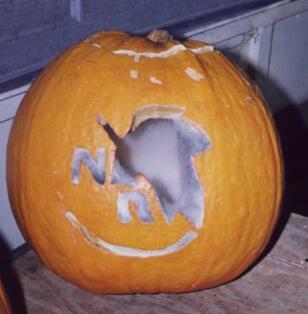 This is the pumpkin that took the longest to carve.